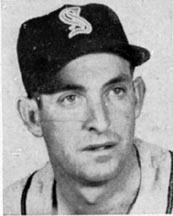 Lanky right-hander Bill Evans hails from Colorado Springs and compiled a 2.96 ERA for the seventh place Memphis team in 1948. Going into the Sacramento's series with Oakland in 1949, his ERA was below three runs per game, but the Solons hitters only scored 7 runs for Evans in 63 innings (i.e. seven runs in nine ballgames). HOME Copyright 2001. William B.Shubb.